Eleven sixth, seventh and eighth graders sat patiently waiting for the 2010 Cherokee County Schools Spelling Bee to begin. No one realized at that moment they would break records. However, when the final word was called, the students had spelled over 325 words, the most in the four years of the bee’s existence. The bee was held last Thursday morning at Martins Creek School. It is co-sponsored by the Cherokee County School system, the Cherokee Scout’s Newspaper in Education program, and Friends of Murphy Public Library. Martins Creek principal Arnold Matthews called out the first word, “discipline.” These middle school students from Martins Creek, Murphy, Hiwassee Dam and Ranger schools were well versed in the discipline of spelling. Their demeanor was poised, unflappable….disciplined. Martins Creek teacher Mrs. Debbie White, who organized the Cherokee County bee, watched quietly as the words sped by. Words like abdicate, enthusiasm, aristocracy, glasnost, monsoon, and ostentatious are examples. A few students missed and the others soldiered on. 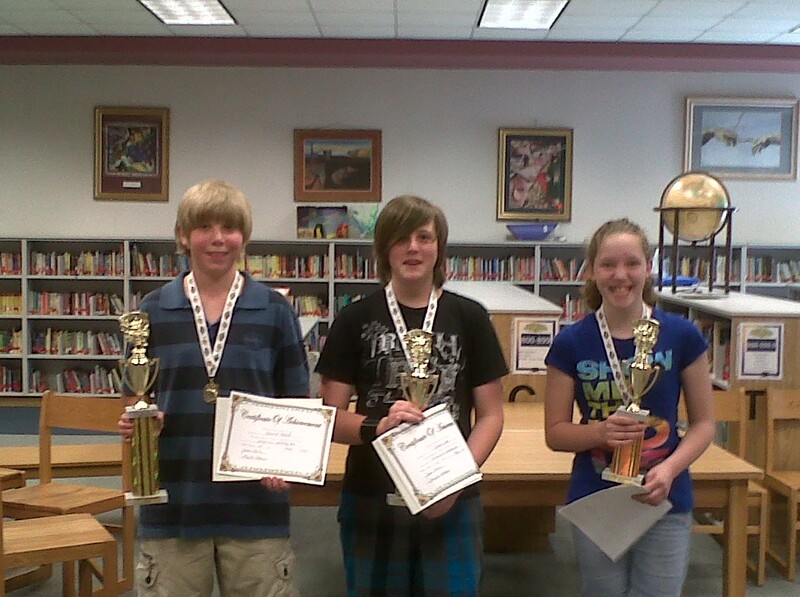 Winners of the 2010 Spelling Bee are D J Mock, Martins Creek; Zach Cook, Murphy Middle School; and Lily Beaster, Ranger Middle School. In the end, Martins Creek eighth grader D. J. Mock won. Murphy Middle School eighth grader Zach Cook came in second, and Ranger sixth grader Lily Beaster was third. When it was over, a second record was set. The bee lasted one and one-half hours, twice as long as the previous year. Each winner received a trophy and a cash prize. Photo by Jo Crowe, The 2010 Spelling Bee broke previous records for amount of words spelled: 325, and length of time the spelling bee lasted: 1-1/2 hours. Eleven students from Martins Creek, Hiwassee Dam, Murphy and Ranger Middle Schools participated: (l to r) Trevor Reid, Madison Guthrie, Maddy Mock, Rachel Payne, D. J. Mock, Vandna Patel, Zach Cook, Bryson Cheek, Lily Beaster, Stephanie Shilling, and Jesse Crowe. All eleven students at the final bee received certificates and gold medals on bee-strewn ribbons. Students who participated in the preliminary spelling bees in their schools received a commemorative presidential dollar coin. Ranger’s principal Paul Wilson and Hiwassee Dam Language Arts teacher Brandy Farmer were also at the bee along with proud parents and grandparents cheering the students on. 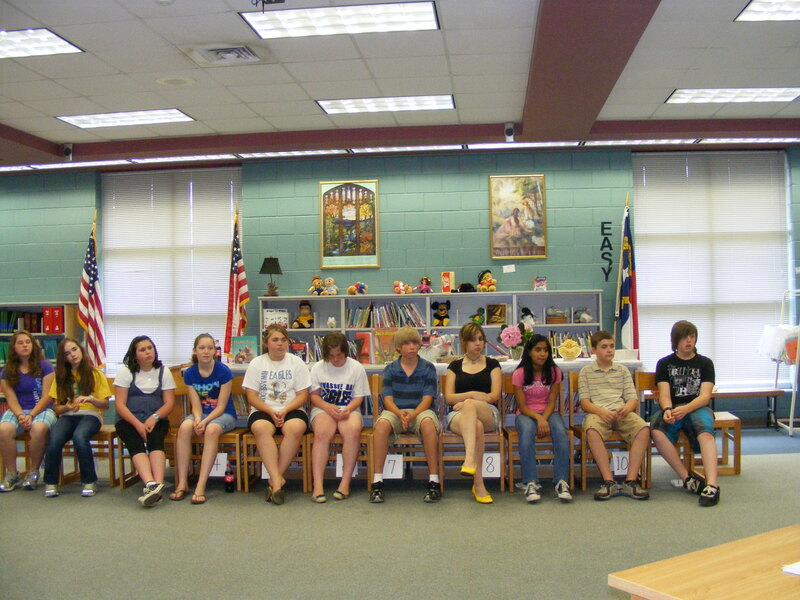 Plans are forming for the 2011 Spelling Bee. All sixth, seventh and eighth graders in Cherokee County schools are encouraged to join the fun and learn new words. Call the Murphy Library at 837-2417 for details. The Cherokee Scout’s Newspaper in Education program and Friends of Murphy Library are cosponsoring the Cherokee County Schools Spelling Bee for the fourth year in a row. Students from sixth, seventh, and eighth grades compete for prizes by spelling words from the National Spelling Bee word list. Martins Creek Middle School is hosting the final bee on Thursday, May 13 at 10 a.m. under the direction of teacher Mrs. Debbie White. The school held its in-school bee on May 6 to find the top three spellers who will compete in Thursday’s final against the best from participating schools. Eight boys and five girls took turns until D. J. Mock was left standing as the winner. Maddy Mock came in second, and Bryson Cheek won third place. Many students return to compete each year of middle school. This year at Martins Creek, D. J. Mock, April Wilson, Chandler Sosebee, Teonna Morin and Gavin Davis all returned to compete. Cherokee County is the ultimate winner to have these intelligent students in its midst. 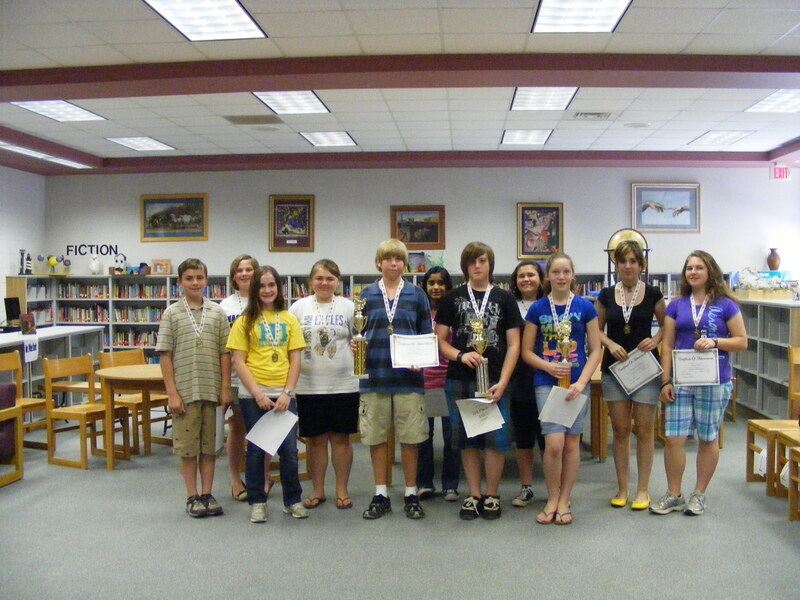 Martins Creek Middle School held its in-school Spelling Bee on May 6. 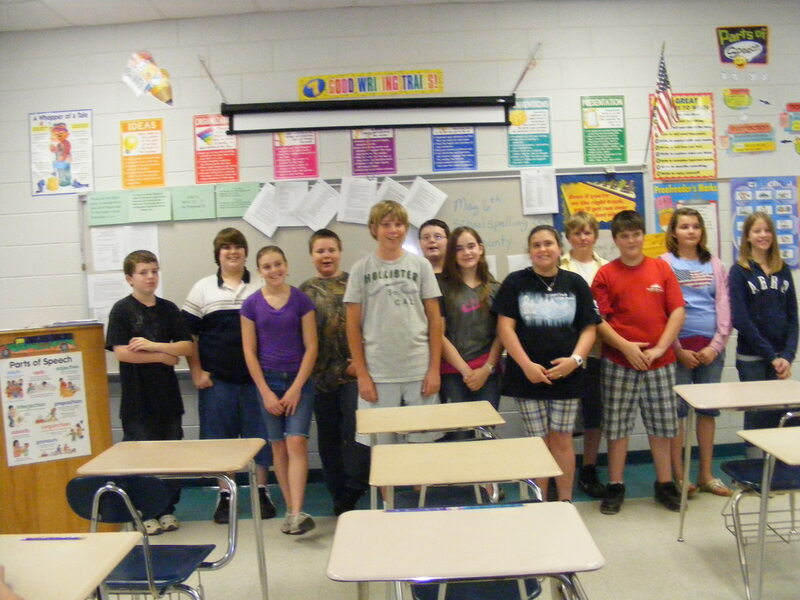 Standing (l to r) Dillon Holbrooks, Dillon Hunt, April Wilson, Sydney Hibberts, D. J. Mock (First Place), Chandler Sosebee, Maddy Mock (Second Place), Bryson Cheek (Third Place), Austen Evans, Dalton Anderson, Teonna Morin, and Holly Redford (from left). Gavin Davis (not pictured) also participated. 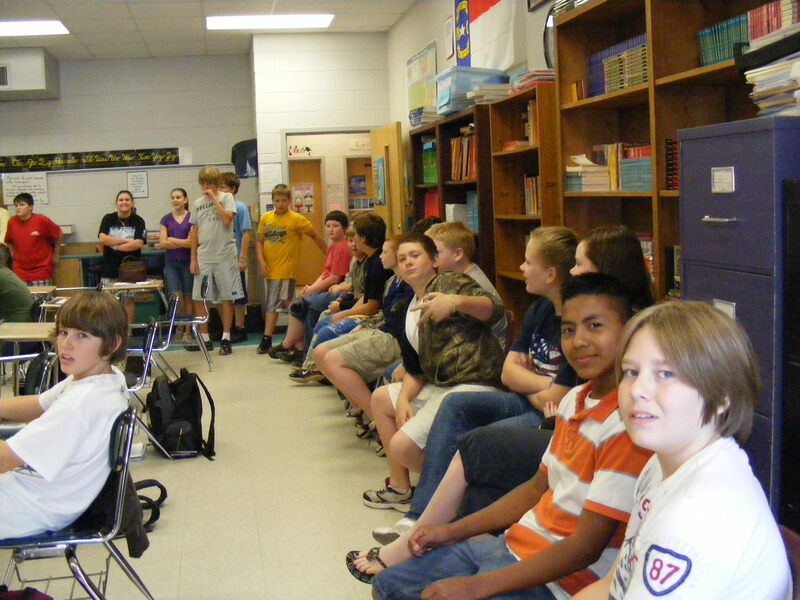 Students wait in Mrs. Debbie White's class for Bee to start. This week’s words for the 2010 Cherokee County Spelling Bee that will take place on May 13 at Martins Creek School are from Arabic, and can be found on the National Spelling Bee web site, www.myspellit.com.